Papaya is an excellent source of vitamins, minerals, antioxidants, phytonutrients and digestive enzymes. 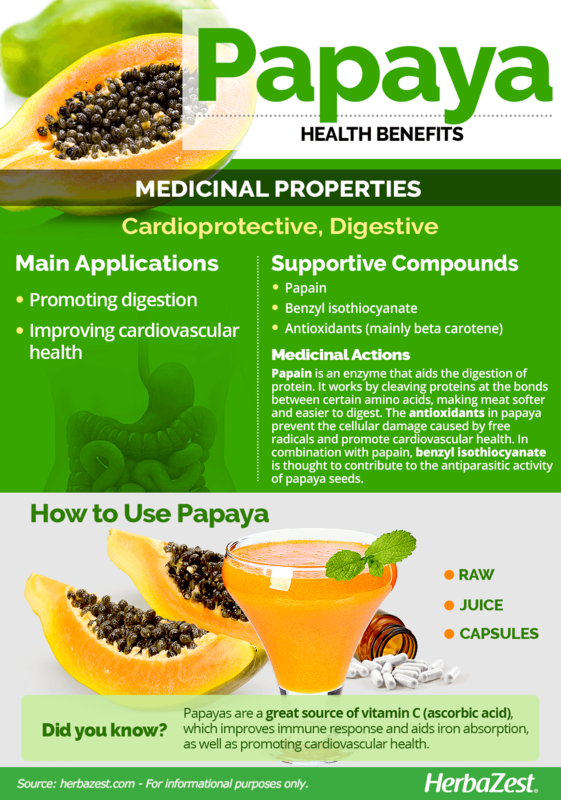 Here are five ways papaya fruit benefits your health, all great reasons to eat more of this amazing energy food. Digestive enzymes in papaya, particularly papayas that are still a bit green, contain protein digesting enzymes like papain. When eaten with or soon after a meal containing meat or another high protein food, these enzymes help to break down the protein into its individual amino acids. Undigested protein can cause many problems in the gastrointestinal tract and can end up putrefying in the colon. Here the bacteria that cause flatulence thrive on it. Many people would feel a lot better and have a lot more energy if they were digesting the protein that they eat more effectively. Eating a bit less is a good start, but the enzymes in papaya can also help. Try having a slice for dessert after that steak dinner and see if you don’t feel a lot better the next day for it. If you can’t always get fresh papaya then green papaya enzymes are available in easy to take capsules. Papaya fruit is rich in antioxidants like beta-carotene, vitamin C, lycopene and vitamin E that can help prevent cholesterol oxidation in your arteries. The oxidation of cholesterol, caused by dietary and environmental free radicals, leads to arterial plaque buildup that can block arteries, causing heart attacks and strokes. By eating energy foods like papaya you can increase your intake of the antioxidants that can improve cardiovascular health and provide protection against developing heart disease. The fiber found in papayas may help reduce LDL cholesterol levels (the bad kind) by reducing the amount that your body absorbs during digestion. Papaya is also a great source of the B vitamin folic acid which has been shown to help control homocysteine levels in the blood. High levels of homocysteine in the bloodstream is known to damage blood vessels and is another significant risk factor for cardiovascular disease. There are many nutrients in papaya fruit that make it a beneficial food for reducing your risk of developing cancer. Obviously seek professional advice when dealing with any serious disease but it is also worth remembering that eating healthier foods can support your body’s natural defenses. In the case of papaya, there are certain nutritional compounds that are especially relevant for reducing cancer risk. The protein digesting enzymes in papaya may help to break down the tough fibrin protein that usually surrounds and protects cancer cells. Reducing the protective fibrin coating layer leaves the cancer cells more susceptible to the body’s own immune system. Natural antioxidants in papaya like lycopene, beta-carotene and beta-cryptoxanthin are all believed to help lower our cancer risk. Papaya fruit also has compounds known as isothiocyanates that assist in preventing cancer by eliminating potential carcinogens from your body and increasing the effects of tumor suppressing proteins. The carotenoids zeaxanthin and lutein are found in good levels in papaya. These phytonutrients are concentrated in the macular area of your eyes where they provide protection against both UV light and high energy blue light that can damage your retina. A diet high in lutein and zeaxanthin is believed to greatly reduce the risk of developing age-related macular degeneration, a leading cause of blindness in the USA. Zeaxanthin and lutein in the diet can also reduce the risk of developing glaucoma, cataracts and other chronic eye diseases. Other rich sources of zeaxanthin and lutein include pumpkins, avocados and leafy green vegetables. A significant number of people also report an improvement in color perception and visual acuity when taking lutein and zeaxanthin in concentrated supplements derived from natural sources. Papaya is an excellent source of nutrients for better skin. Vitamins C and E, beta carotene and lycopene all help protect your skin from free radical damage that can lead to wrinkles and other skins of aging. Vitamin C also promotes collagen production, needed to maintain skin’s firmness and elasticity. Papaya enzymes in the pulp and particularly still green skin can break down dead skin cells and promote skin renewal when used as a facial treatment. They may also help with acne, blemishes, age spots and reducing minor skin scarring. Additionally, the many nutritional benefits of papaya can only help improve the skin from the inside as well. These are just some of the many ways papaya fruit benefits your health. If you haven’t tried it in a while I’d really recommend picking one up and enjoying their delicious taste.